TORONTO, April 18, 2018 – Just three days left until the start of Woodbine’s 2018 Thoroughbred season on Saturday, April 21. Follow along as we eagerly countdown to Opening Day with some of our top jockeys. Rafael Hernandez cracked the top three standings at Woodbine for the first time in his career during the 2017 meet with 154 wins and more than $5.4 million in purse earnings. Among 11 stakes wins, he celebrated his second straight victory in the $400,000 Breeders’ Stakes Triple Crown leg in rein to the Bill Mott-trained Channel Maker. Other meet highlights included a graded stakes win in the Grade 3 Grey Stakes with Archaggelos and victories in a pair of Canadian classics aboard promising youngsters Clickity Clack ($225,000 Princess Elizabeth) and Aheadbyacentury ($225,000 Coronation Futurity). How did you spend your winter? I went to Aqueduct in New York to ride for the first time. I had never been to that track before for the meet. I got a good opportunity through an agent over there who called me this winter to see if I wanted to go there and try. I just took a chance and I did okay; I won 14, a couple of seconds and thirds, and I won a couple of stakes over there this winter. 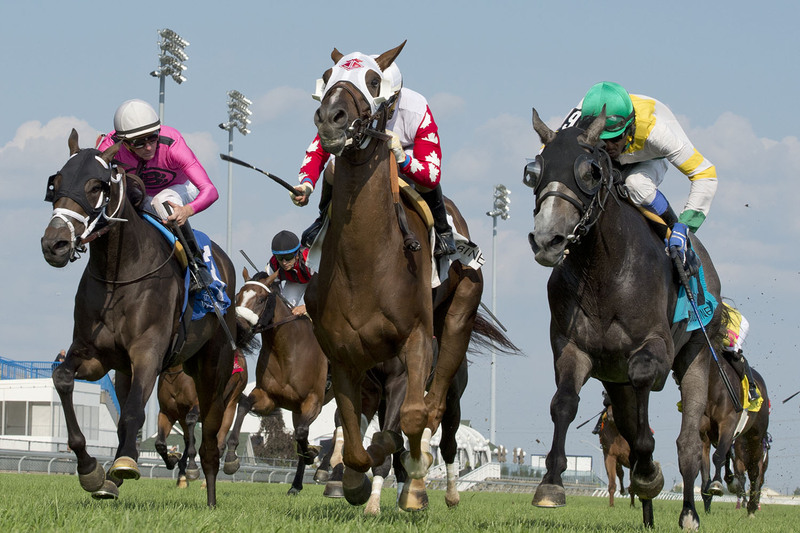 What are you most looking forward to about the Woodbine meet? I’m just looking forward to working hard and trying to be better than last year. I sit down with my agent Tony Esposito and we talk about the horses. I always try to do something different, better for this year. The first time I was here two years ago, I came in July and I did okay so last year was actually my first full year and I’m doing really good, so this year I hope that I do a little better. How do you prepare for the meet? That’s why I go to Aqueduct to try to get business from people shipping from New York to here and I just try to stay in shape. Actually, that’s more important, so by the time the meet is open here, I’ll be in good shape because I stay active all year riding. What do you love most about being a jockey? I like to travel, I like to meet a lot of new people and I love to ride horses. I always had horses when I was a kid in Puerto Rico on the farm. I always had horses, I love horses, I love to ride horses. How did you fall in love with horse racing? I always had horses, like I said in Puerto Rico, but just for hanging out with my friends. I had a friend and he used to be a jockey and he told me, ‘You should be a jockey!’ He told me that when I was like nine years old. I didn’t know anything about that. When he told me that, I started looking around and I liked the adrenaline of racing – like how fast they go and everything. And that’s how I got my start looking to be a jockey when I was nine years old. What has been your favourite fan interaction? My kids are my number one fans. My kids and my wife. My family is the best. That’s why I’m here today. Whatever I’ve been doing in my career is because my wife and my kids have been supporting me. I’m here because of them. I appreciate that a lot. My wife always gives me her time, to be with me and support me all the time. And my agent Tony Esposito is the one who gave me the opportunity to come here too. I met him in Florida at Gulfstream Park and then we clicked together and I’m here now. He’s always helped me. I appreciate everything he does for me. This entry was posted in Woodbine Insider and tagged Horse Racing, Opening Day, Rafael Hernandez, Woodbine. Bookmark the permalink.